Going to a horse show for the first time is very exciting, and yet it can also have a serious learning curve. If you’re a seasoned rider who has been showing for years, you probably forgot how intimidating your first show was. You need to know what to pack, find where you’re stabled, navigate the horse show office, and locate the warm-up ring. Then there is knowing when, how, or even if you should sign up at the gate for your round, let alone how much time to give yourself to get warmed up. This takes a lot of experience and a whole lot of hurry up and wait. 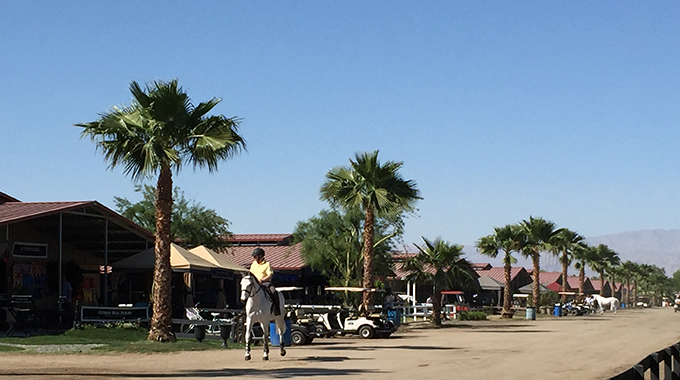 Before heading to the show office, find out where you’re stabled (if you don’t already know). After that, it is time to visit the show office. Take a signed, open check to leave with them, have your signed entry form ready, and don’t forget your membership/association numbers. Once you are all checked in, you will receive your number. At the end of the show you will go back to the show office to check out. This is when you go over your invoice and confirm your classes, stabling, shavings, feed and other show fees, and fill out the open check you left with them. Be kind to the show office staff! Show your appreciation and be patient. Having them on your side can really come in handy when you forget to enter a class or order feed before the cut off time! Your class will either have a set order of go or an open sign up. If it’s the later, your trainer will sign you up when they think it’s best for you to go in the class. This go time will depend on when your next class is, and when your fellow riders are in other classes, as to avoid a conflict (this is important because it’s hard for trainers to be in 2 places at once). Look online the night before, the morning of, or ask your trainer when they signed you up so you know when your class starts and when you go in the order. If your class is later in the day, arrive early enough to learn. If you’re a jumper you’ll walk your course. Be sure to watch some rounds before you. More often than not, other classes before yours will be the same course or be using similar lines. This is your chance to watch and learn, see how they ride, and where people are having trouble spots. 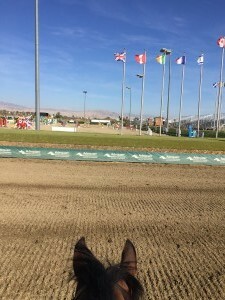 It can’t be said enough; riders who study other riders at a show can learn and understand what is needed to improve and apply it to their own riding. Give yourself plenty of time to get to the show ring, especially if it is far away from where your horse is stabled. You don’t want to run out of time to warm-up or miss you turn because it took you so long to get to the ring itself. 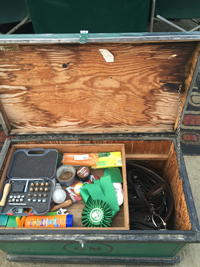 If you have a parent, friend, or groom with you, have them bring a grooming box to clean up your horse between your warm-up and when you go into your class. Any extra tack you have used recently is always good to have on hand: spurs, crop, and a running/standing martingale. If it looks like the weather might turn, you might also want to bring a rain coat for you and rain sheet for your horse. Don’t forget about your needs too! Bring yourself a snack and water bottle. But most importantly, don’t forget your number!! 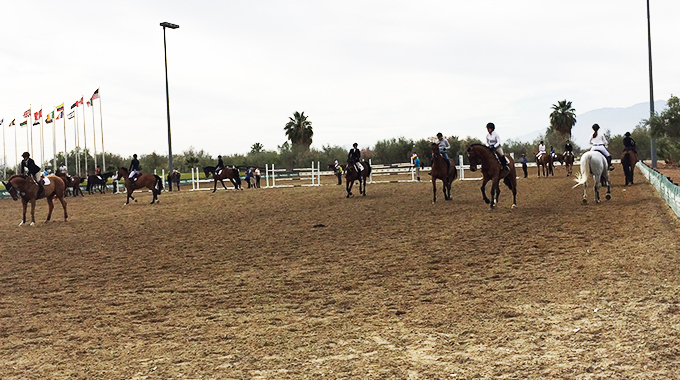 When riding in the warm-up ring, you’re probably riding with more horses at once than you’re used to. This can be overwhelming. So be sure to keep your ears and eyes open. Remember, those who are jumping have the right of way, as do riders who are going faster than you, so give them the rail. When approaching someone head-to-head at the same speed, don’t forget to pass left hand to left hand. Be sure you take care of yourself. Horse shows are a lot of early mornings, late nights, and waiting around. 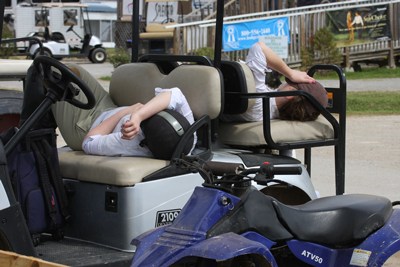 If you have down time, it’s important to take a nap or relax so you won’t be overly exhausted before you ride. Even more important, your body needs fuel, so no matter how excited or nervous you are, you need to eat and stay hydrated. Bring money for the horse show concession or pack snacks. Don’t forget you are an athlete, and your body needs fuel to perform. No skipping breakfast just because you’re rushing out the door at the crack of dawn. Give your horse carrots, treats and “pats” after you ride. Rub and pat your horse to set them at ease and let them know they’ve been good. Got a Grassroots Question? Ask Cori! Cori wants to hear from you! If you have a grassroots question, use the form below to ask Cori. We may just use your question for a blog post or a video. Not all questions submitted will be answered due to the volume of requests. We will chose a few each month to answer. Originally from Canada but now living in beautiful sunny Southern California, Cori is the daughter of a trainer, so she was practically born and raised on a horse. She spent her junior years showing non-stop in the hunters, equitation and jumpers, while also helping with the family business (coaching students, training horses, mucking stalls you name it). She has learned a lot over the years from some amazing horsemen and women and has had lots of experience with different types of horses and students of many abilities. Bernie Traurig and his daughter, Natasha, demonstrate correct and safe mounting & dismounting techniques. Including getting on a horse from the ground, a mounting block and from a leg up. In this video Bernie Traurig takes the frustration out of missed diagonals by teaching a rider on a lunge line to feel the diagonal by closing her eyes, focusing on the rhythm of the trot at both the sitting and posting trot. 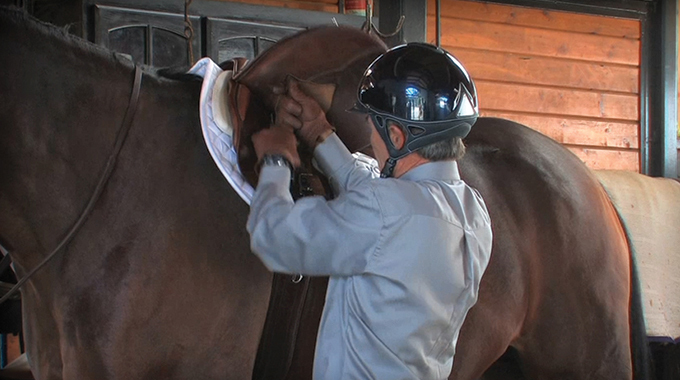 In this video, Bernie demonstrates how to keep your saddle in place without the use of a sticky saddle pad or a breastplate. Ask for a class printout in the show office once you have your number. This will have a comprehensive list of all of your classes that you or your trainer has entered you in so you know your schedule. You should be on for your class and headed to the warm up approx. 10-12 rounds before you go in the ring. That’s roughly 30 mins. Never rely on the printed schedules for accurate times! Rings basically always run late. Always check with the back gate announcer to get an accurate time for your class. Learn your course before you get on. It will be posted close to the in-gate. Braiders expect to get paid on Saturday. Those who are juming definitely have the right of way but NOT the rail. They should be on the inside. This prevents people from cutting into their path and vice versa. Try to minimize the amount of circles made in the warm up when crowded and never circle in front of jumps. Ask questions of your fellow barn mates who can show you the ropes!! Great tips Emma! Thanks for sharing.